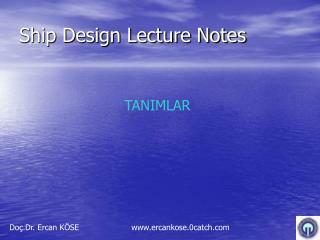 Ship Design Lecture Notes TANIMLAR Doç.Dr. 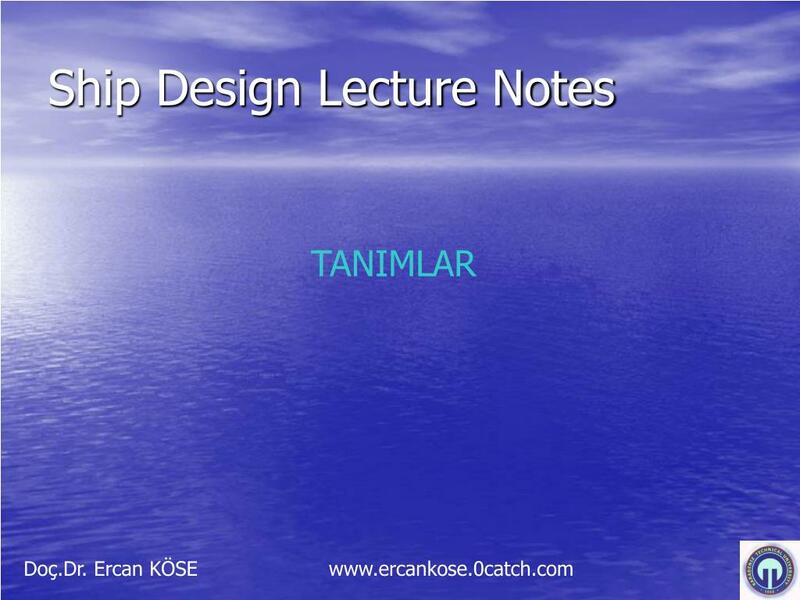 Ercan KÖSE www.ercankose.0catch.com BASIC DEFINITONS AND SHIP GEOMETRY Figure illustrates the main parts of a typical ship. 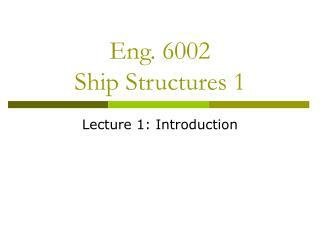 Hull: The structural body of a ship including shell plating, framing, decks and bulkheads. Figure illustrates the main parts of a typical ship. 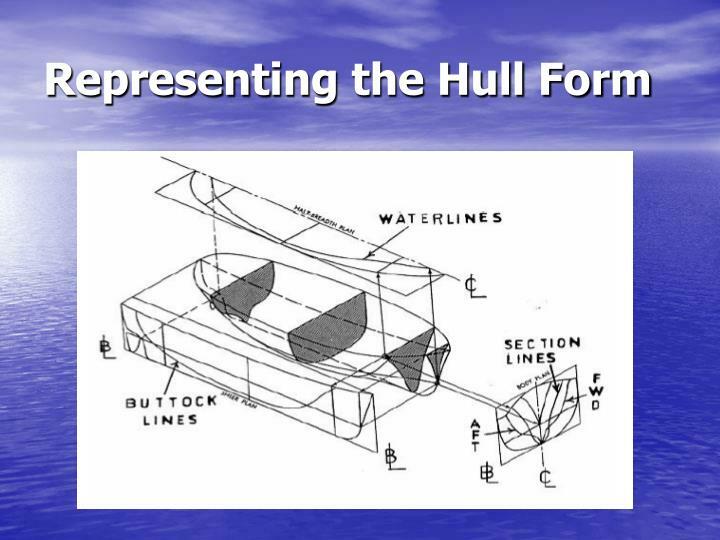 Hull: The structural body of a ship including shell plating, framing, decks and bulkheads. 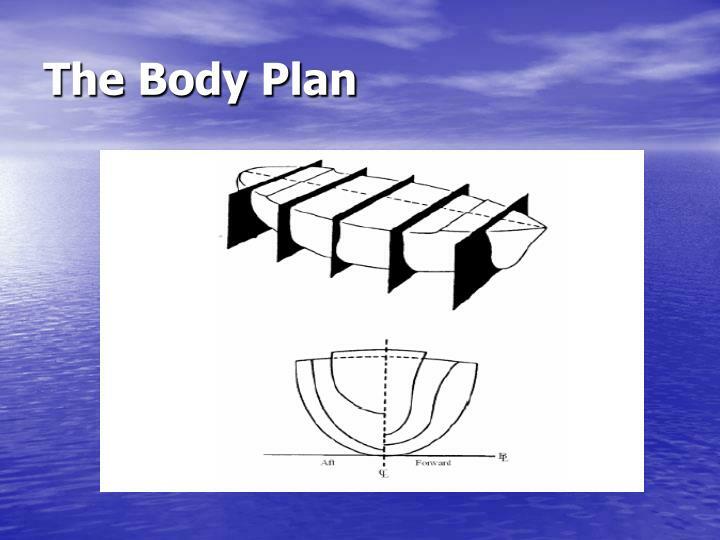 Afterbody : That portion of a ship’s hull abaft midships. 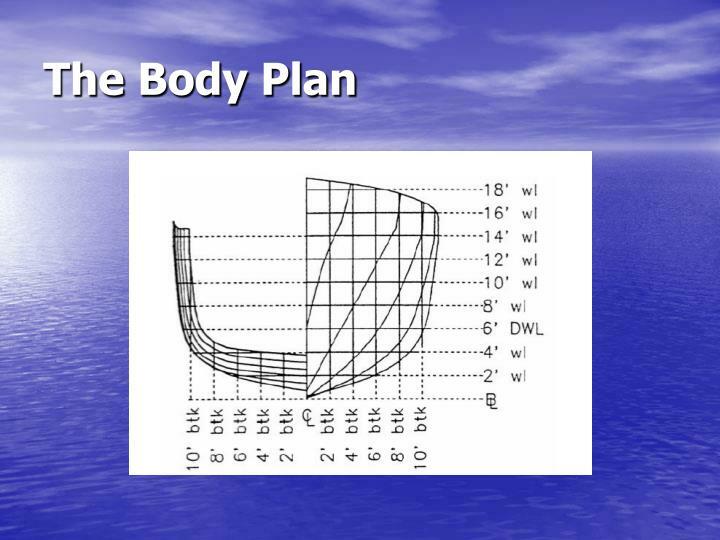 Forebody: That portion of a ship’s hull forward midships. 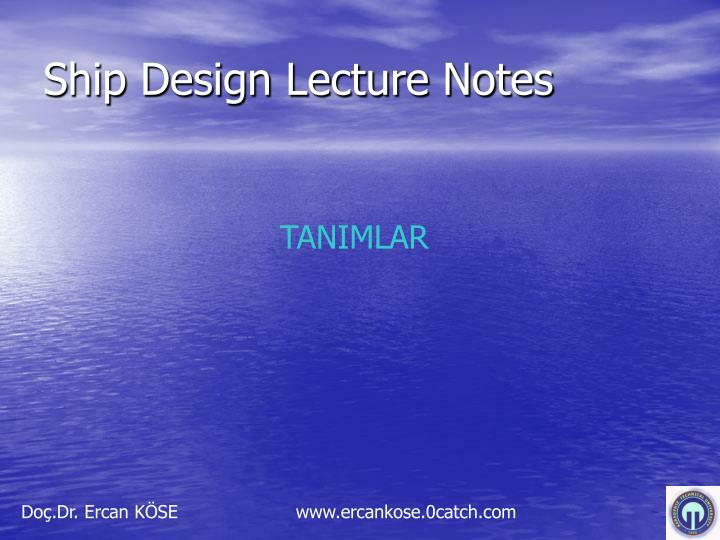 Design Waterline (DWL) or Load Waterline (LWL) : The waterline at which the ship will float when loaded to its designed draught. 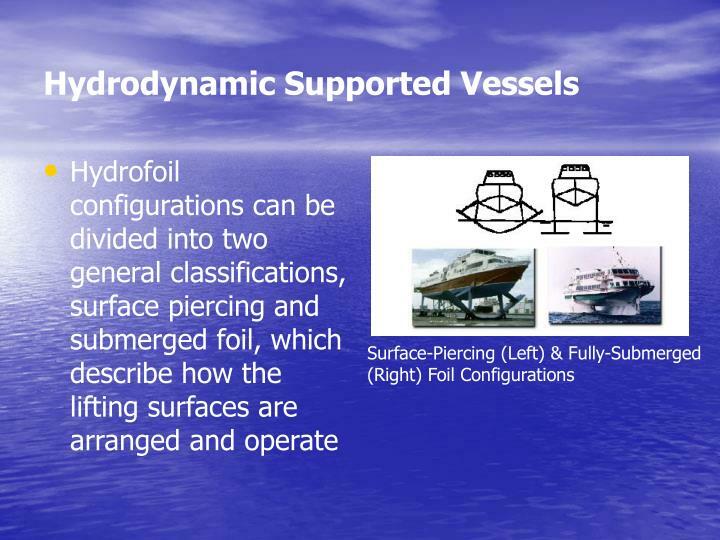 Moulded Surface : The inside surface of the skin, or plating, of a ship. Forward Perpendicular (FP) : The vertical line at the point of intersection of the LWL and the forward end of the immersed part of the ship’s hull. After Perpendicular (AP) : The vertical line at the point of intersection of the LWL and the centerline of the rudderstock. 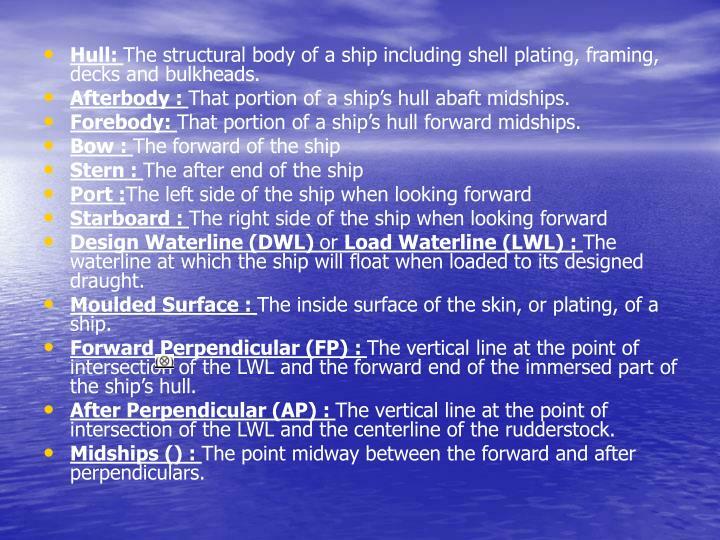 Midships () : The point midway between the forward and after perpendiculars. Deck Camber : The rise of the deck of the ship in going from the side to the centre. 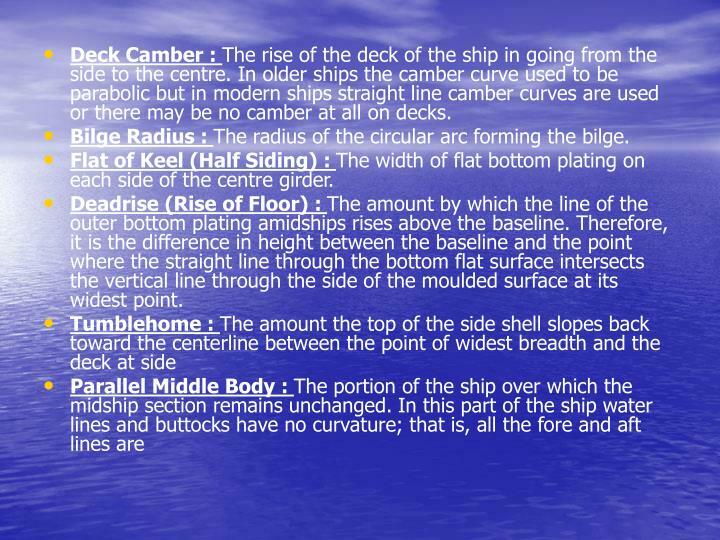 In older ships the camber curve used to be parabolic but in modern ships straight line camber curves are used or there may be no camber at all on decks. Bilge Radius : The radius of the circular arc forming the bilge. Flat of Keel (Half Siding) : The width of flat bottom plating on each side of the centre girder. 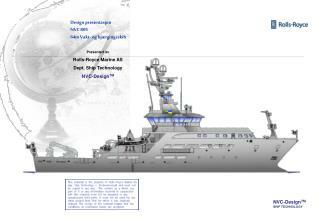 Deadrise (Rise of Floor) : The amount by which the line of the outer bottom plating amidships rises above the baseline. Therefore, it is the difference in height between the baseline and the point where the straight line through the bottom flat surface intersects the vertical line through the side of the moulded surface at its widest point. 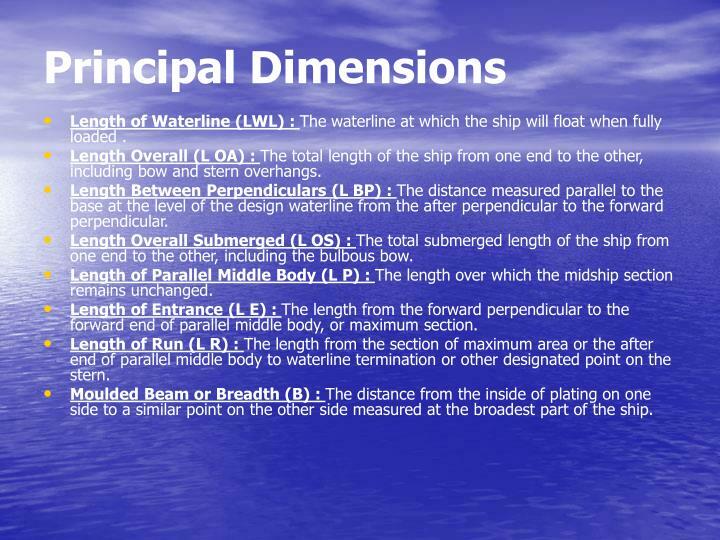 Length of Waterline (LWL) : The waterline at which the ship will float when fully loaded . Length Overall (L OA) : The total length of the ship from one end to the other, including bow and stern overhangs. Length Between Perpendiculars (L BP) : The distance measured parallel to the base at the level of the design waterline from the after perpendicular to the forward perpendicular. Length Overall Submerged (L OS) : The total submerged length of the ship from one end to the other, including the bulbous bow. Length of Parallel Middle Body (L P) : The length over which the midship section remains unchanged. Length of Entrance (L E) : The length from the forward perpendicular to the forward end of parallel middle body, or maximum section. 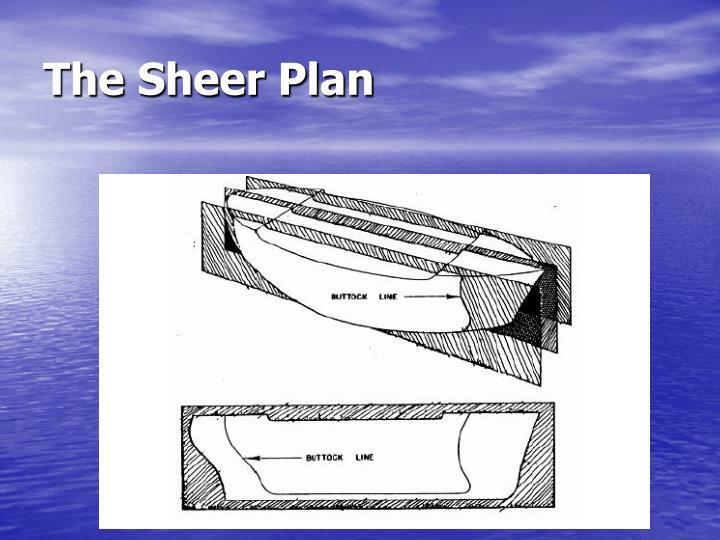 Length of Run (L R) : The length from the section of maximum area or the after end of parallel middle body to waterline termination or other designated point on the stern. 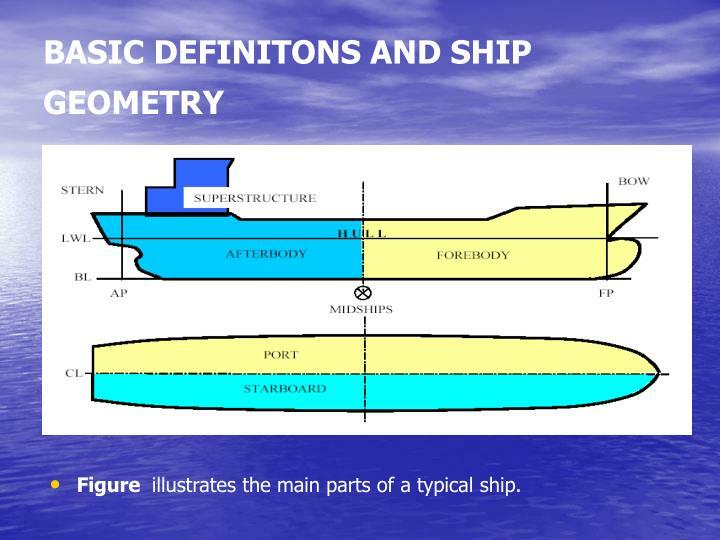 Moulded Beam or Breadth (B) : The distance from the inside of plating on one side to a similar point on the other side measured at the broadest part of the ship. 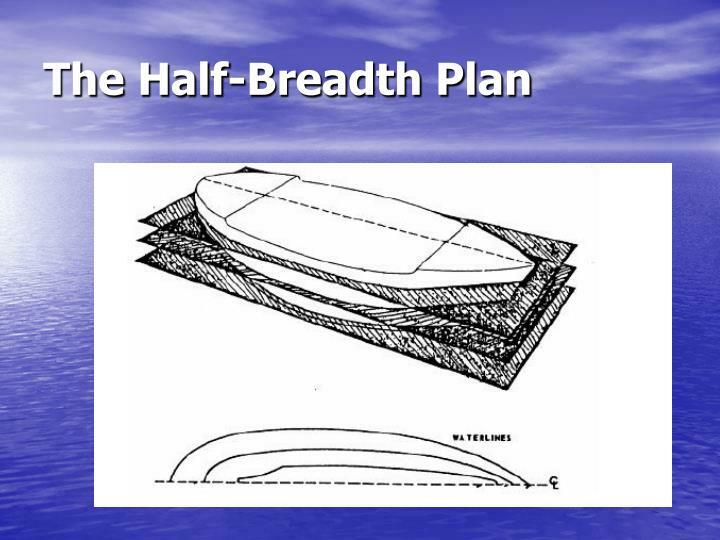 Maximum Beam or Breadth (B M) : Extreme beam (breadth), from outside to outside of the shell plating. 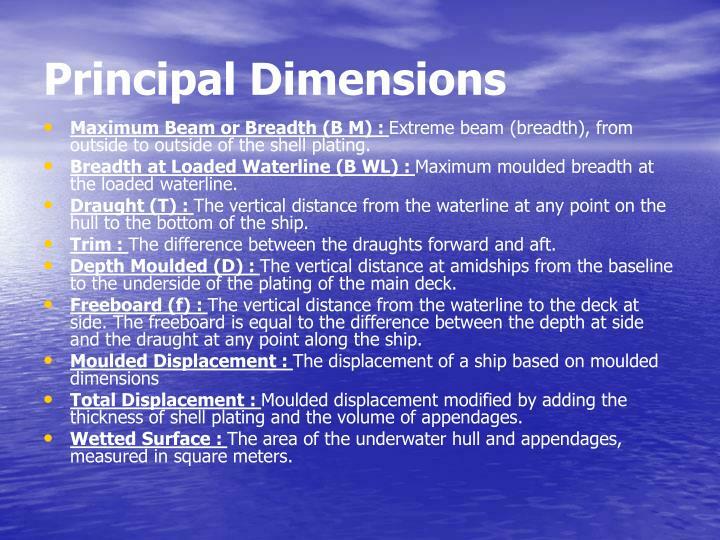 Breadth at Loaded Waterline (B WL) : Maximum moulded breadth at the loaded waterline. Draught (T) : The vertical distance from the waterline at any point on the hull to the bottom of the ship. Trim : The difference between the draughts forward and aft. Depth Moulded (D) : The vertical distance at amidships from the baseline to the underside of the plating of the main deck. Freeboard (f) : The vertical distance from the waterline to the deck at side. The freeboard is equal to the difference between the depth at side and the draught at any point along the ship. Total Displacement : Moulded displacement modified by adding the thickness of shell plating and the volume of appendages. Wetted Surface : The area of the underwater hull and appendages, measured in square meters. The weight of water that would displaced by the volume of the hull measured on the outer surface of the shell plating below the waterline. 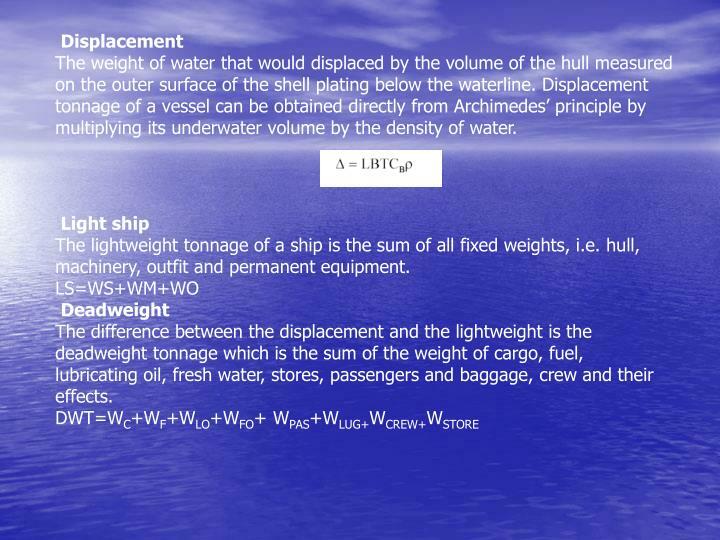 Displacement tonnage of a vessel can be obtained directly from Archimedes’ principle by multiplying its underwater volume by the density of water. 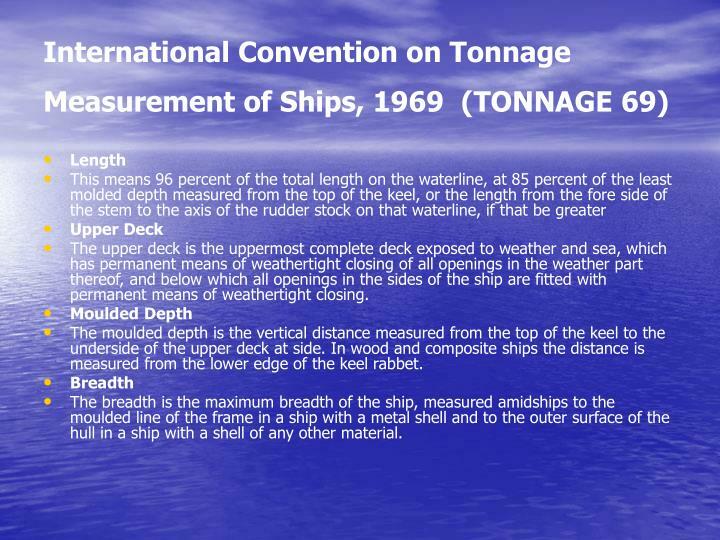 The lightweight tonnage of a ship is the sum of all fixed weights, i.e. 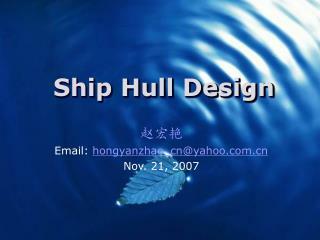 hull, machinery, outfit and permanent equipment. The difference between the displacement and the lightweight is the deadweight tonnage which is the sum of the weight of cargo, fuel, lubricating oil, fresh water, stores, passengers and baggage, crew and their effects. 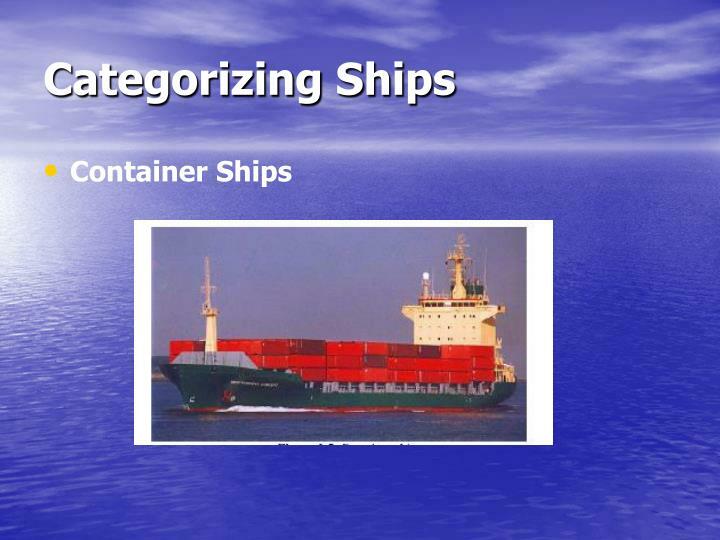 Container Ships are designed for stowage of containers in vertical stacks or cells either within the hold of the vessel, on deck, or a combination of the two. 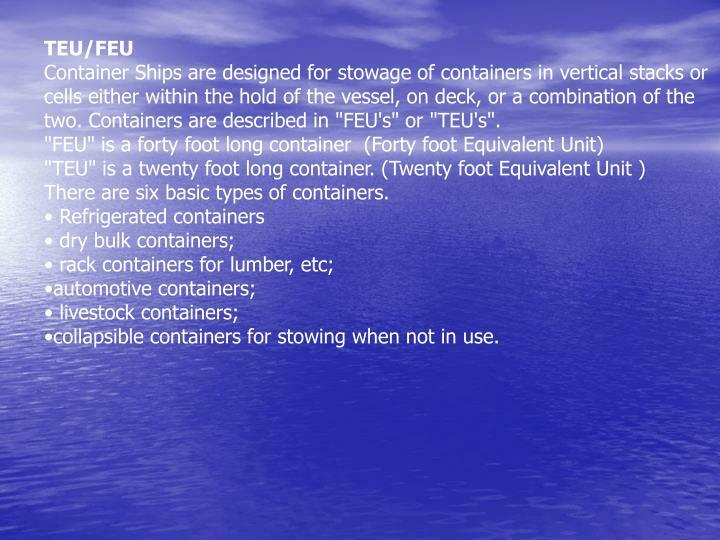 Containers are described in "FEU's" or "TEU's". 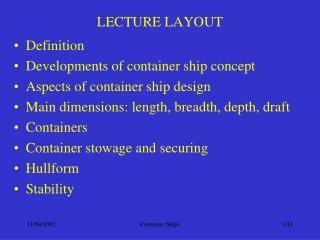 There are six basic types of containers. collapsible containers for stowing when not in use. fuel oil is equivalent to 6.63 barrels. on the frames and to the underside of the deck beams. 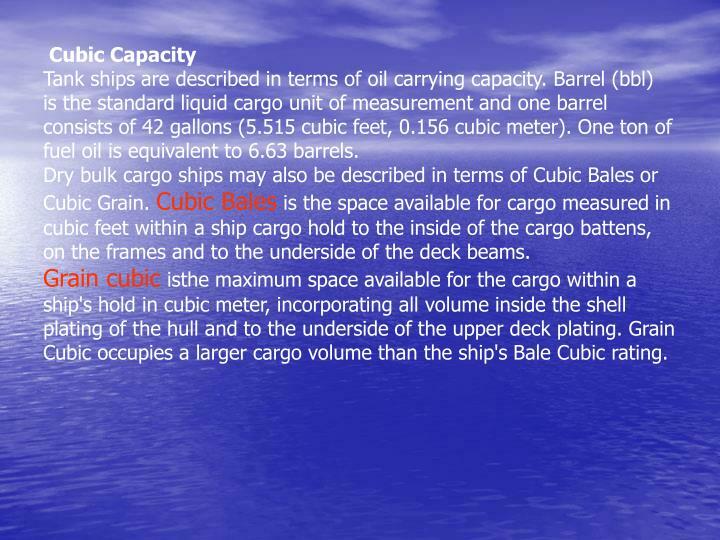 Cubic occupies a larger cargo volume than the ship's Bale Cubic rating. 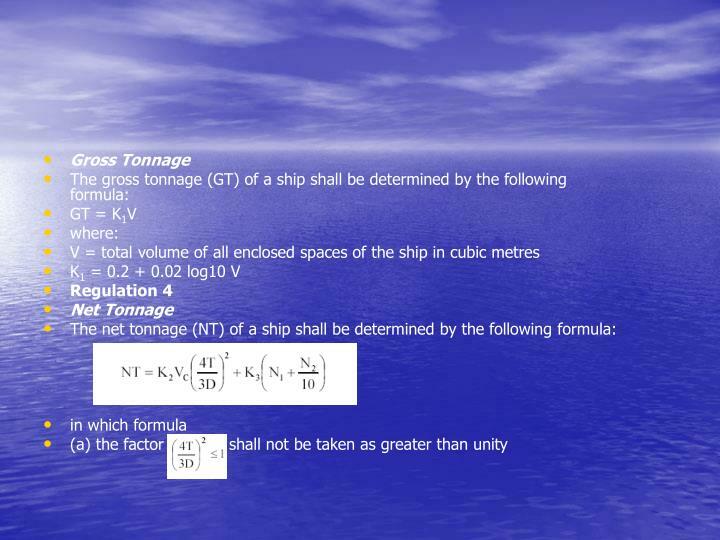 Gross tonnage is the capacity of the spaces in the ship's hull and of the enclosed spaces above the deck available for cargo, stores, fuel, passengers, and crew. 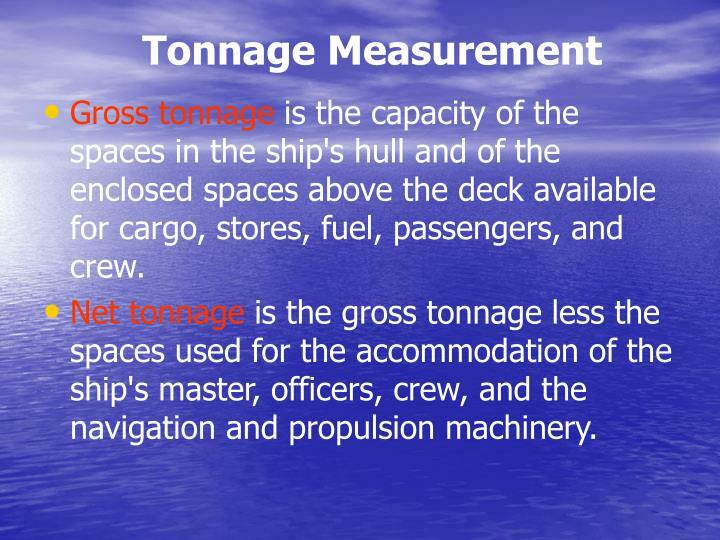 Net tonnage is the gross tonnage less the spaces used for the accommodation of the ship's master, officers, crew, and the navigation and propulsion machinery. The upper deck is the uppermost complete deck exposed to weather and sea, which has permanent means of weathertight closing of all openings in the weather part thereof, and below which all openings in the sides of the ship are fitted with permanent means of weathertight closing. The moulded depth is the vertical distance measured from the top of the keel to the underside of the upper deck at side. 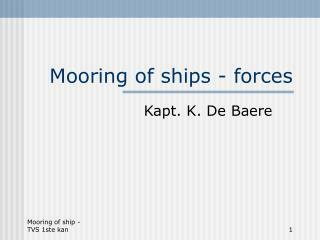 In wood and composite ships the distance is measured from the lower edge of the keel rabbet. 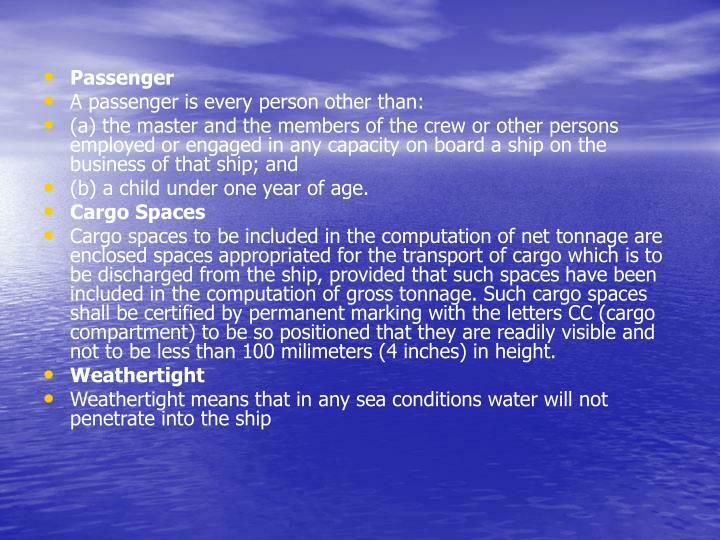 Cargo spaces to be included in the computation of net tonnage are enclosed spaces appropriated for the transport of cargo which is to be discharged from the ship, provided that such spaces have been included in the computation of gross tonnage. Such cargo spaces shall be certified by permanent marking with the letters CC (cargo compartment) to be so positioned that they are readily visible and not to be less than 100 milimeters (4 inches) in height. 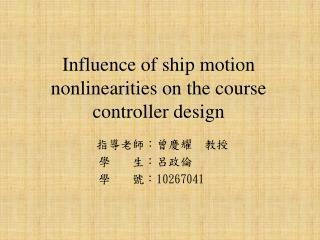 Ships are generally designed for a specific reason. 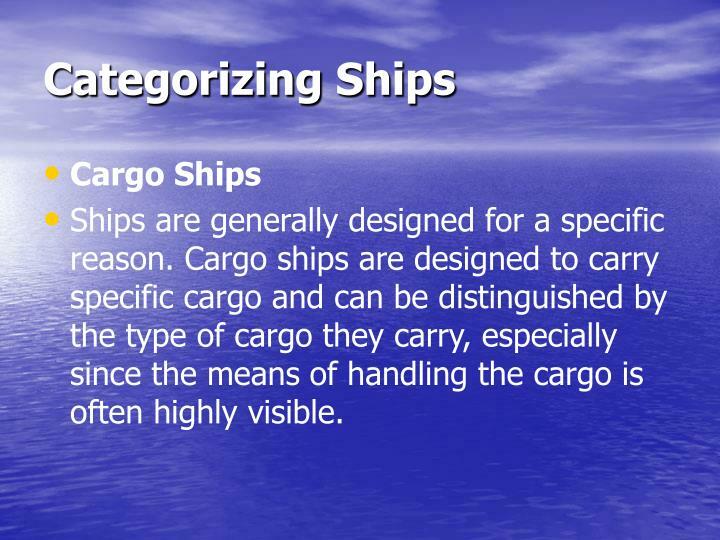 Cargo ships are designed to carry specific cargo and can be distinguished by the type of cargo they carry, especially since the means of handling the cargo is often highly visible. Bulk Cargo such as coal, wheat, cement, grain or any item moved in bulk quantities. Break bulk cargo is cargo that may be affixed to a pallet. 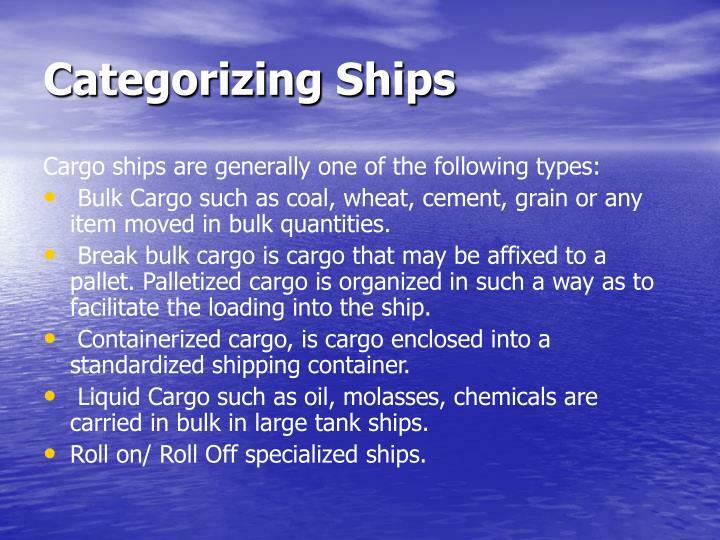 Palletized cargo is organized in such a way as to facilitate the loading into the ship. 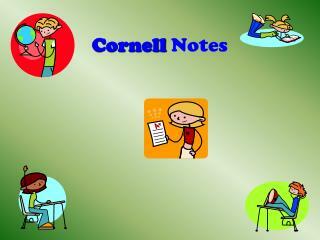 Containerized cargo, is cargo enclosed into a standardized shipping container. Liquid Cargo such as oil, molasses, chemicals are carried in bulk in large tank ships. Roll on/ Roll Off specialized ships. 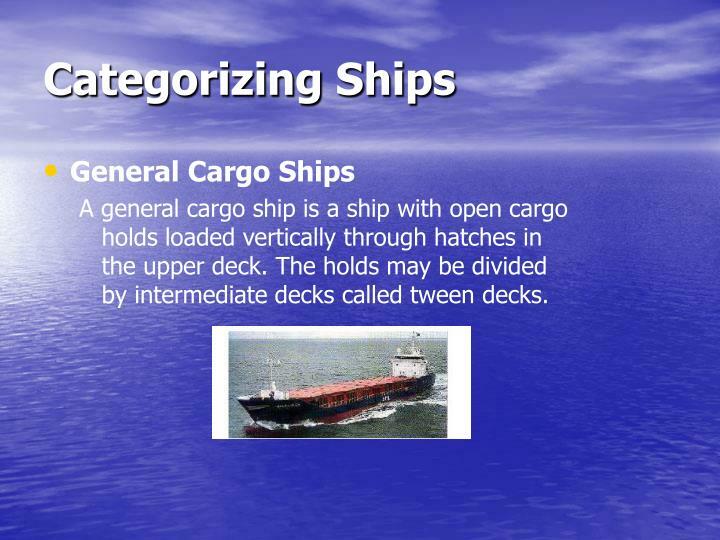 A general cargo ship is a ship with open cargo holds loaded vertically through hatches in the upper deck. The holds may be divided by intermediate decks called tween decks. 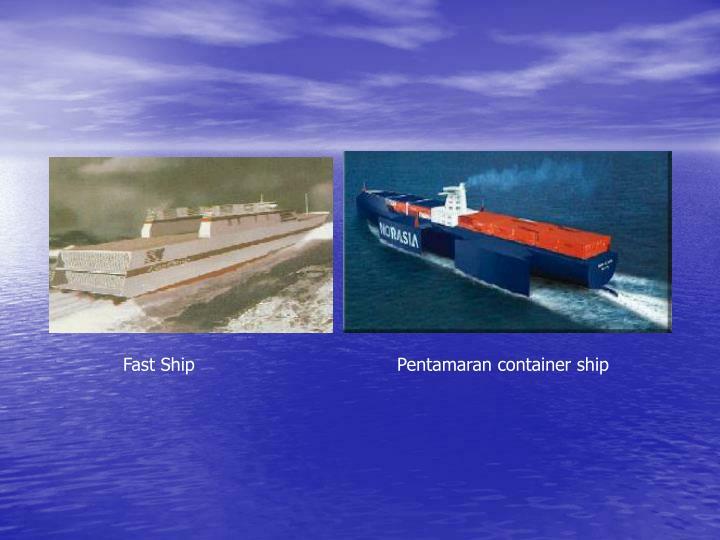 An extension of the container ship concept is the barge-carrying ship. 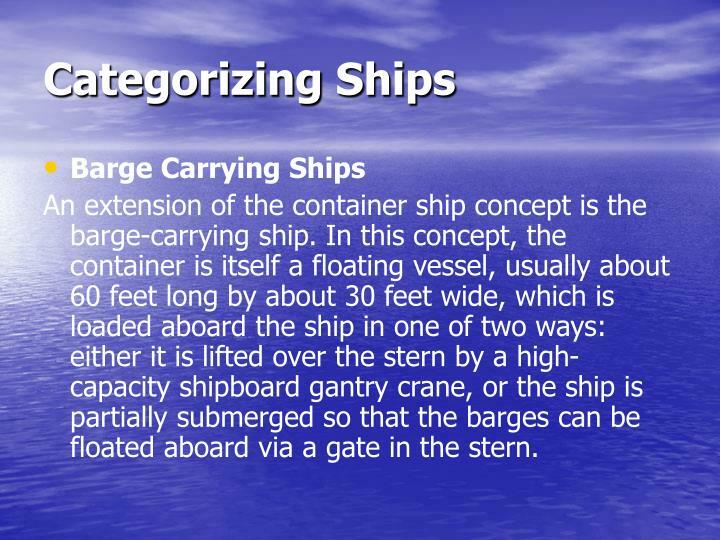 In this concept, the container is itself a floating vessel, usually about 60 feet long by about 30 feet wide, which is loaded aboard the ship in one of two ways: either it is lifted over the stern by a high-capacity shipboard gantry crane, or the ship is partially submerged so that the barges can be floated aboard via a gate in the stern. 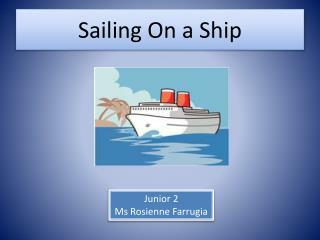 Aboard Ship. 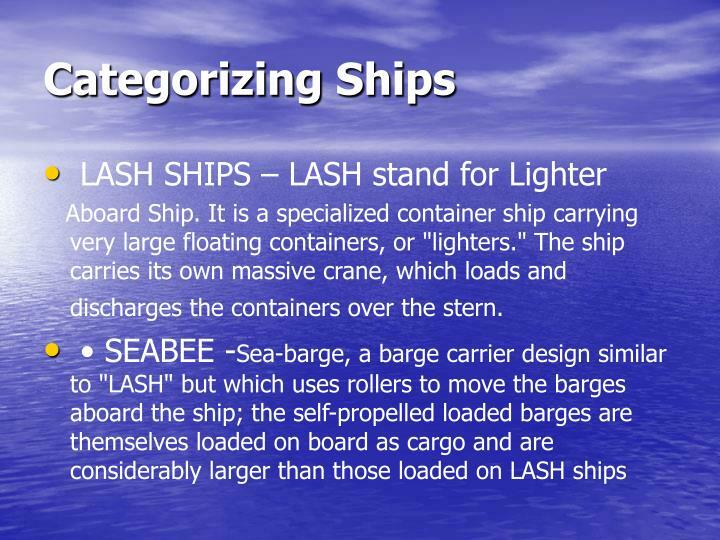 It is a specialized container ship carrying very large floating containers, or "lighters." The ship carries its own massive crane, which loads and discharges the containers over the stern. 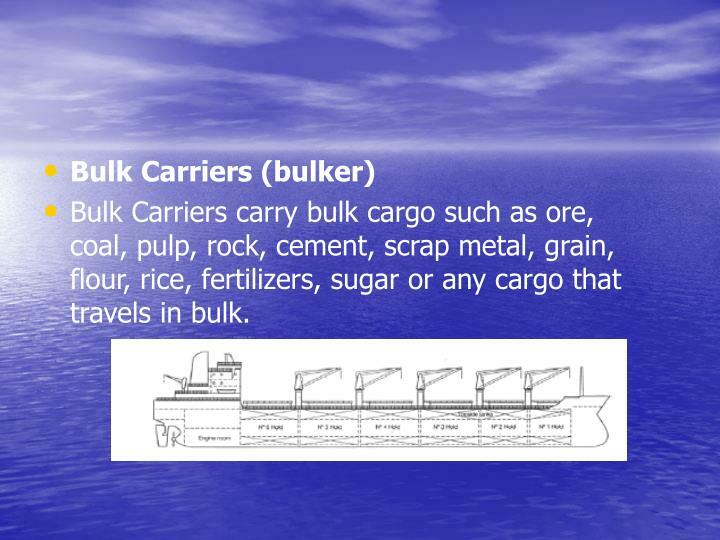 Bulk Carriers carry bulk cargo such as ore, coal, pulp, rock, cement, scrap metal, grain, flour, rice, fertilizers, sugar or any cargo that travels in bulk. 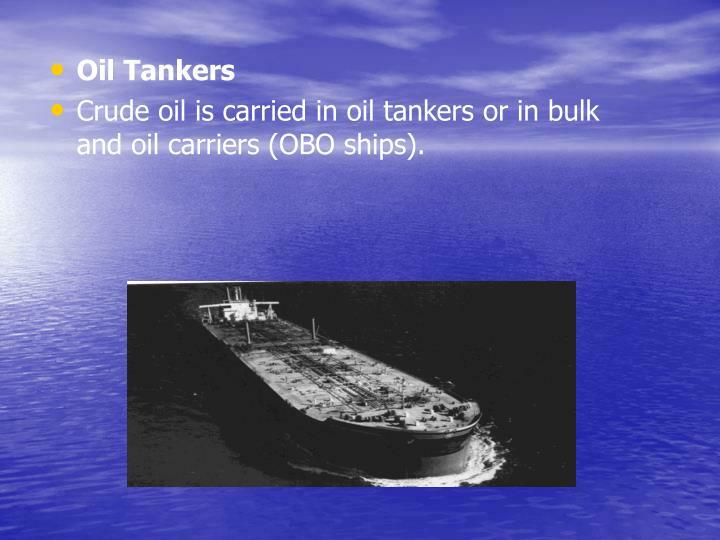 Crude oil is carried in oil tankers or in bulk and oil carriers (OBO ships). 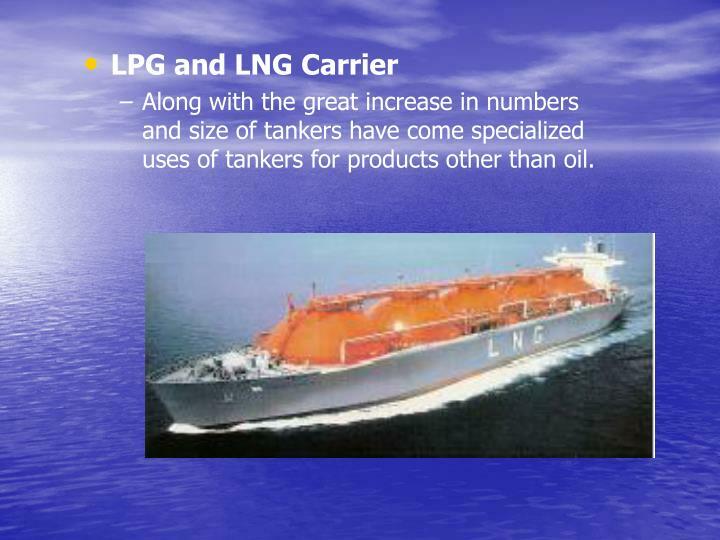 Along with the great increase in numbers and size of tankers have come specialized uses of tankers for products other than oil. 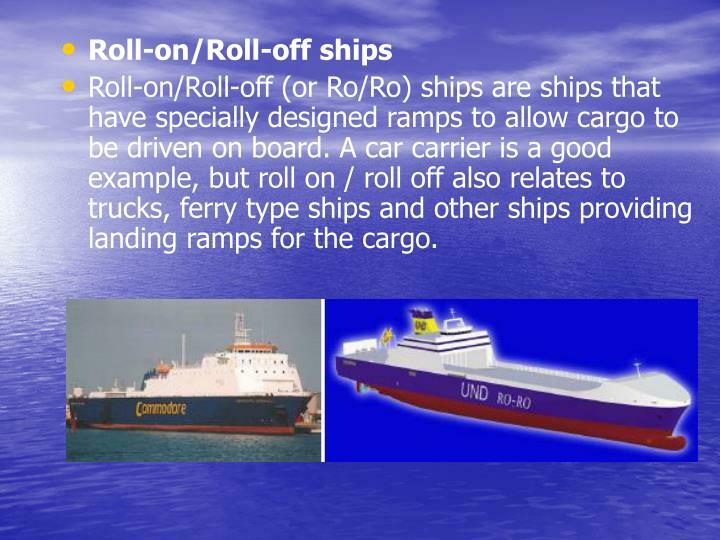 Roll-on/Roll-off (or Ro/Ro) ships are ships that have specially designed ramps to allow cargo to be driven on board. 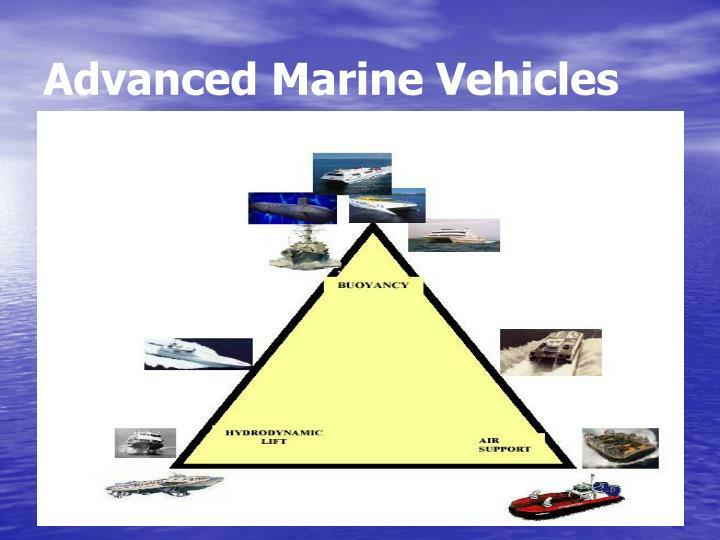 A car carrier is a good example, but roll on / roll off also relates to trucks, ferry type ships and other ships providing landing ramps for the cargo. 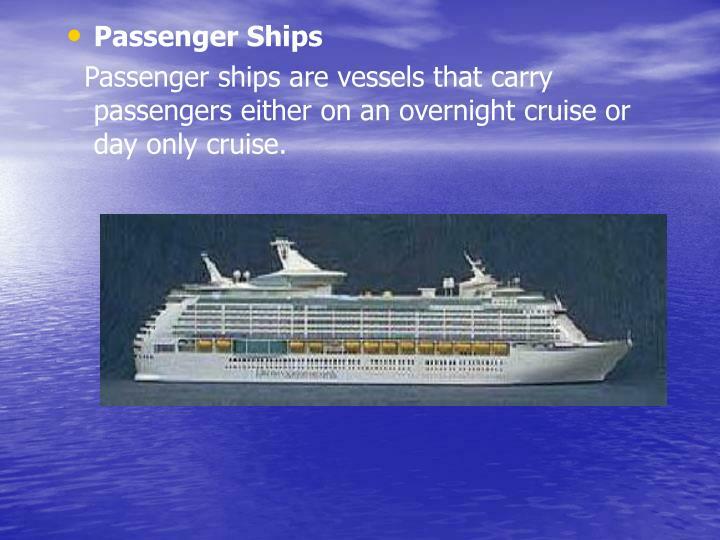 Passenger ships are vessels that carry passengers either on an overnight cruise or day only cruise. 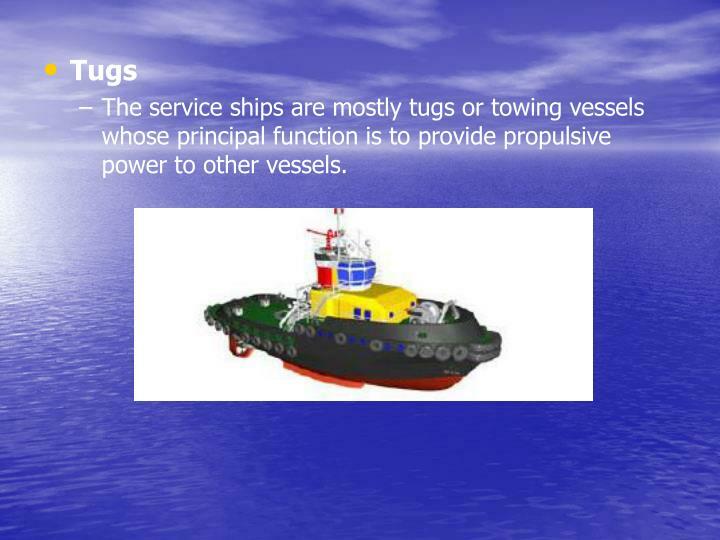 The service ships are mostly tugs or towing vessels whose principal function is to provide propulsive power to other vessels. 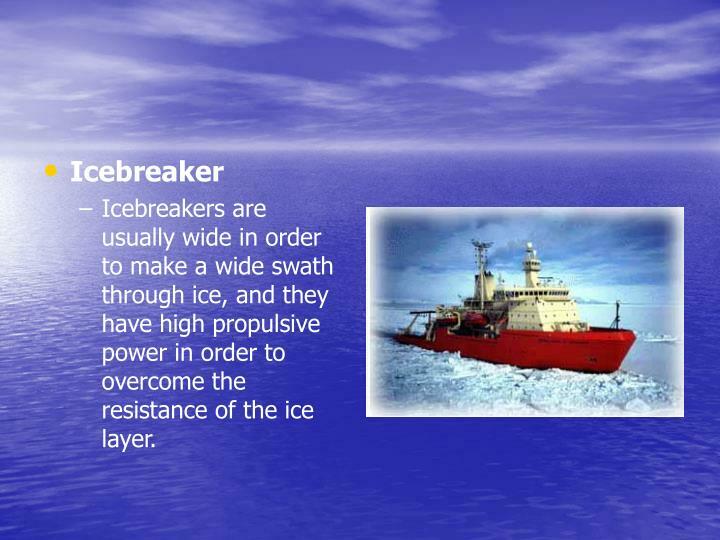 Icebreakers are usually wide in order to make a wide swath through ice, and they have high propulsive power in order to overcome the resistance of the ice layer. 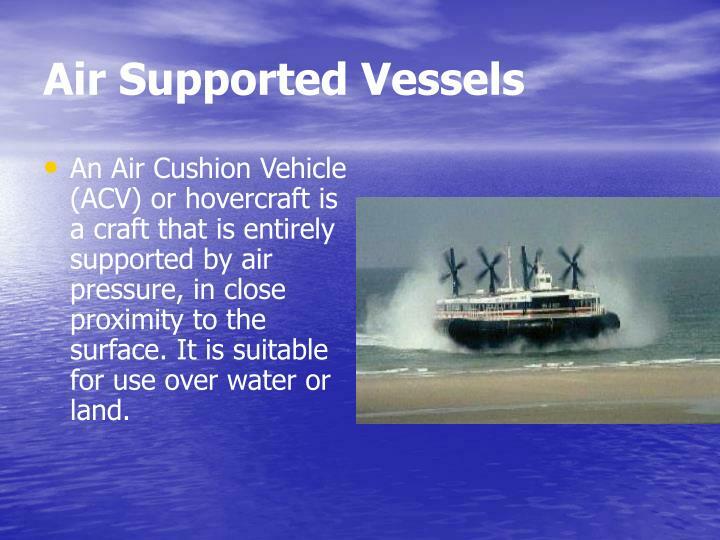 An Air Cushion Vehicle (ACV) or hovercraft is a craft that is entirely supported by air pressure, in close proximity to the surface. It is suitable for use over water or land. 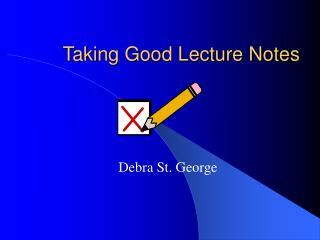 WIG is an abbreviation of Wing-In-Ground effect. A WIG craft can be seen as a crossover between a hovercraft and an aircraft. 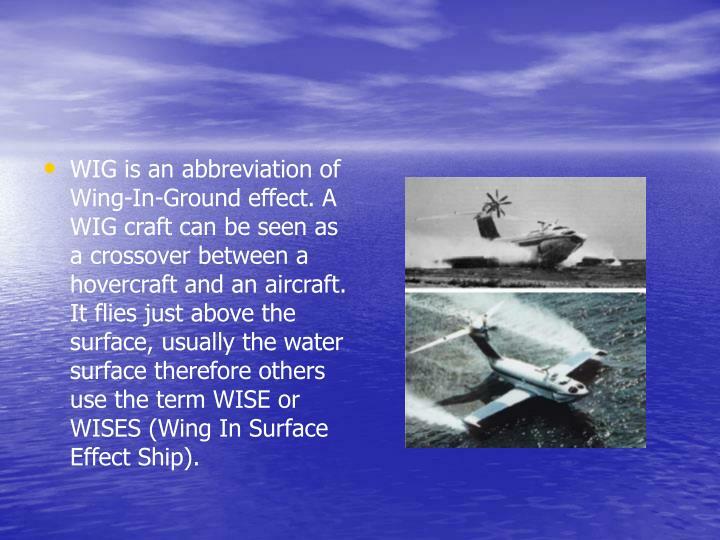 It flies just above the surface, usually the water surface therefore others use the term WISE or WISES (Wing In Surface Effect Ship). 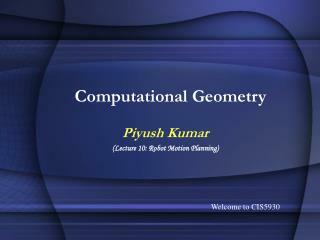 Computational Geometry -Piyush kumar (lecture 10: robot motion planning). computational geometry. 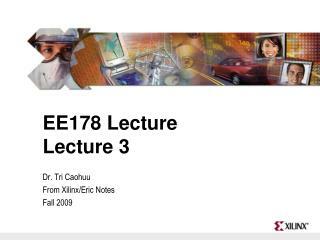 welcome to cis5930. reading. 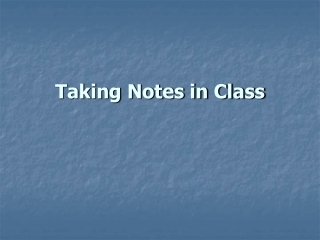 chapter 13 in textbook david mount’s lecture notes. 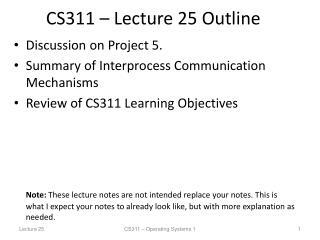 slides sources lecture notes from dr. bayazit dr.
Lecture 2 Design Abstraction -. 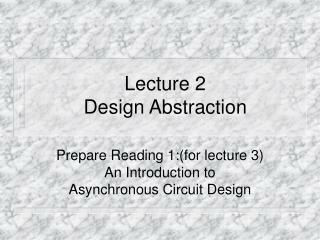 prepare reading 1:(for lecture 3) an introduction to asynchronous circuit design. design abstraction. 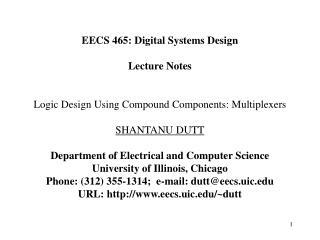 english executable program register transfer language gates transistors rectangles. specification. 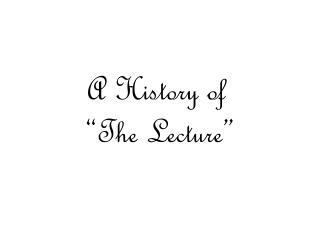 LECTURE LAYOUT -. 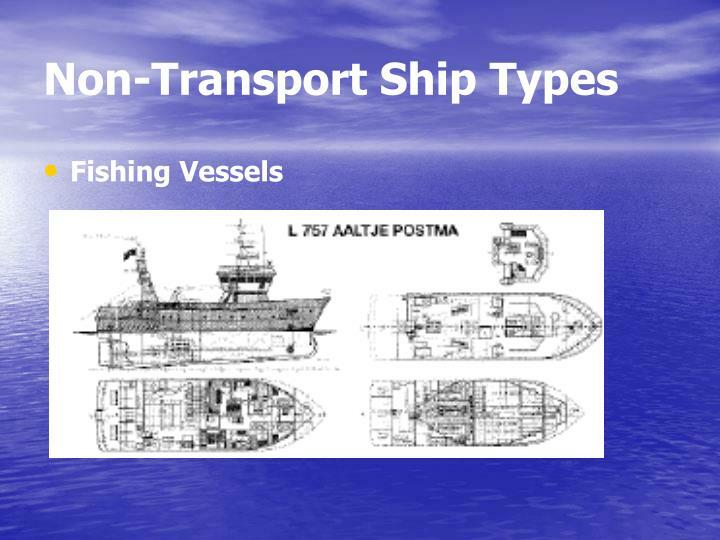 definition developments of container ship concept aspects of container ship design main dimensions: length, breadth, depth, draft containers container stowage and securing hullform stability. 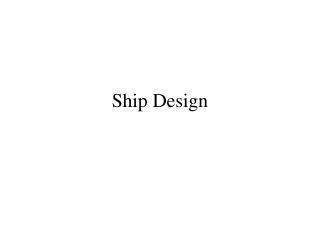 What is E-ship? Why is E-ship Important? Who is in the E-ship Talent Pool? 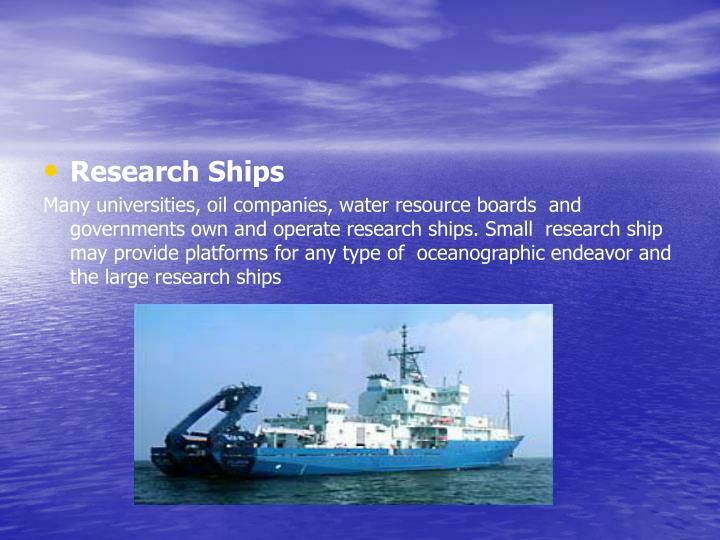 What are the Key Elements of E-ship? 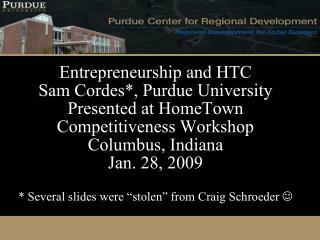 Program -Entrepreneurship and htc sam cordes*, purdue university presented at hometown competitiveness workshop columbus, indiana jan.
Ship Design -. ship life cycle. definition of requirement determination of data and constraints concept design preliminary design contract design detail design production tests and trials service scrapping. definition of requirements.